Please be patient. The mods are all unrostered volunteers who reply to members as they are able to. Some of us also work. Many of us are also dealing with our own withdrawal issues. I applied again to Altostrata, because I thought that for the first time it is done incorrectly. Those are good notes, Asta. Thank you. It appears that trazodone puts you to sleep for about 6 hours, which makes sense. What time do you wake up? What are your symptoms like when you wake up? How often does "short-term headache, ear and throat pain" occur in the mid-morning? When did this start? You mentioned your symptoms overall had gotten weaker since you stopped escilatopram July 30. Are they still getting weaker? Hi, I go to bed around 10 PM wake up around 5 am or 6 am. At night I wake up around 1AM and 3 am, usually manage to fall asleep again. Symptoms that are getting up, wrote their symptoms chart. Ear and throat pain appeared after about three days after the cessation of drug use, it is about 1 hour, no more for several days. Headache absent often short-lived. Symptoms weaker than the first two weeks of discontinuation of drug. Now the main problem is anxiety (a very uncomfortable feeling in the chest, I think it is less dense and a bit softer than the beginning). As I said, this feeling never had before. Also, some days there very unpleasant emotional instability, which takes about 2-3 hours. I feel that some day better, some worse. Preferably, there is no anxiety and emotional instability. What is your symptom pattern between 5 a.m.-6 a.m., when you wake up, and 8:30 a.m.? What does this anxiety feel like? Is it different in the morning than in the evening? I do not always feel of symptoms only after awakening. Sometimes it is anxiety, mild shortness of breath, or anger - emotional instability. Which only feel symptoms at scoping diary of symptoms, because late difficult to remember. If not written at that time, then did not feel anything wrong. More early morning symptoms was the discontinuation of medication about 2 weeks. I can not specify when anxiety is stronger, sometimes in the morning, sometimes at evening , and sometimes during the day. But as I mentioned it weaker and less frequent than in the beginning, when only discontinue. Fish oil started to drink when discontinuation of medication. Also, over the month drank group B vitamins, vitamin C, and minerals. Now also received a Young Living juices, which contain many trace elements, amino acids and vitamins. What you think about Young Living Oils? Are there any herbal remedies, which can not be used in combination with trazodone (I know that St. John's wort should not be). Yet I think I should try magnesium. Thank you very much for the advice. I'm going to jump back in here to your introduction/journal for a minute. Many of us find we have to be fairly cautious with any type of supplement due to increased sensitivities to things. In general, I stick to single ingredients, and then just try one new thing at a time. It sounds like some of your supplements/additives have mixed ingredients. If I were you......I would avoid those for now. You might want to return the juices formulation......for now, if unopened......... This might be something you can consider at a later date. As you've had some adverse responses to the medication(s)/drug, I think you should proceed carefully. You may be a bit sensitive. I still use an old fashioned calendar with boxes, to record anything new tried. And then I wait........in case I have a new symptom.......it's easy to trace back to something I've recently done differently. You can also note improvements with this form of record keeping, which helps a lot.......to see that you are having improvements, and making progress. It helps to take away from focusing on the negatives. Look at the magnesium link that Alto and I have left here for you. I'm a fan of the Epsom salt(magnesium sulfate) in my bath. Very calming. And then I often do use magnesium citrate, diluted in water to drink over a time period. I don't usually down it all at once. Many here use capsules of magnesium once or twice a day. Especially look at the first part of the magnesium link to find out more on the different types. To search here on the site, go to symptoms and self care.......and at the top right you will see a search box. You can type in the topic you'd like more information on and you should find many options to look at. Many here do find B6 over stimulating. I know I did. Another noticed that I am sensitive to certain sounds, noise. And yet two months of taking Cortistop (Young Living). 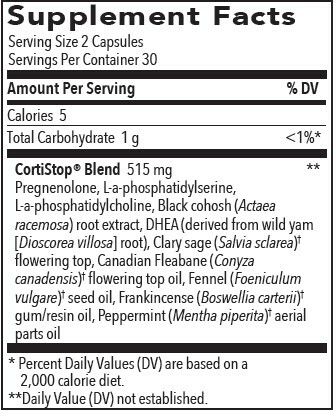 CortiStop® Women's is a proprietary dietary supplement designed to help the body maintain its natural balance and harmony. When under stress, the body produces cortisol. Im high on cortisol even when im not stressed at the moment. Just trying everything to help mitigate the terrible symptoms of WD. How long you been off Lexapro now? How long were you on it again? Escitalopram taking almost 5 months, stopped the 8 weeks. Im 14 weeks and better. But not normal yet. You will find as each month passes you get better im sure. I hear the 1st 6 month is the worse. Asta, waves of symptoms are "normal" for withdrawal syndrome. It's good that yours are getting weaker. Be sure to treat your nervous system gently, it's trying to fix itself. I'm not familiar with the herbs etc. you mentioned. Generally, we recommend only fish oil and magnesium. St. John's Wort is NOT a good idea. Please search for topics about herbs and supplements in the Symptoms and Self-care forum. I would sure hold, if I were you, in investing any more money in multiple ingredient supplements..........like the ones that apparently are being peddled to you via Young Living. The Cortistop was easy to find by just googling. And it contains multiple ingredients of unknown amounts. Pretty pricey too!!! Cancel your continued order if you have one, and tell them that you have sensitivities, and have had adverse reactions to medications if you have to. You shouldn't have to. Companies like these thrive on selling people more than they can use, it's called MLM(multilevel marketing), and also often make unfounded claims as to the healing properties of their products. I would not spend any more money on this or getting more of their proprietary blends now. I'm a user of some essential oils via the skin, or in the air with a diffuser. But.........extra caution for those of us in acute or protracted W/D. I'm doubtful Young Living has any knowledge of this. Hi all, three days really felt quite well. Yesterday evening, suddenly a headache and nausea. I tried to sleep, I got up from terrible specific headache, I newer had like this. One head side so much pressure, to sinus pressure emerged, presureally one eaye . Very vomiting, Ear and throat pain. I went to the hospital have been given pain medication and magnesium. Pain decreased slightly, but not disappeared, and now feel sick. Is there someone had done so? Is this W/D? Thank you, Lee, for the kind words, we now really need them. Why until now allow the sale of these poisons, I really do not understand ..
Hi all, three days﻿ really felt quite well. Yesterday evening, suddenly a headache and nausea. I tried to sleep, I got up from terrible specific headache, I newer had like this. One head side so muc﻿h pressure, to sinus pressure emerged, presureally one eaye . Very vomiting, Ear and throat pain. I went to the hospital have been given pain medication and magnesium. Pain decreased slightly, but not disappeared, and now feel sick. Is there someone had done so? Is this W/D? Okay then......good that you got checked out. And oh boy.......if I were you, I would go very cautious with the "pain medication" most certainly, depending on what it is, of course. If it's an opiate or derivative of/ or synthetic, man made........it's always best......in my opinion........to switch to something non-addictive as soon as possible. When did the vomiting occur in relation to your drug intake? Drug and symptom notes again will be helpful. Time on the left. Drug, dose, and symptoms on the right. It's up to you now.......with help, to keep educating yourself, and empowering yourself and begin to manage your health assertively. You might consider taking it a bit easy on reading, if you are doing a lot of this.........here..........and then thinking, that you'll have the worst case ever........as far as W/D goes. Time, patience........the acceptance of W/D, and increased sensitivities to drug and other substances. You need to be aware of this increased sensitivity and let prescriber's and supplement peddlers know of this. We can't take care of other medical issues here, if one has been diagnosed in your case. It's unclear to me from the information given. And excellent on the 3 days feeling really quite well!!! Super. In the hospital did not say that it terminated antidepressant. Anyway, they will not understand anything about W/D, just get carries away. The hospital has established migraine, injected magnesium and mild pain medication-Metamizole. Home supply drinking Ibuprofen- nor strong for pain, said it helps. My main question vomiting and headache WD? It also hurt the stomach. It could be related to your Trazodone/Triticco. An adverse effect of this medication. And then, yes, some W/D symptoms from the Lexapro. And thank you for the additional information. "It's nasty because it has an evil active metabolite, meta-Chlorophenylpiperazine (mCPP), and a huge number of interactions with other drugs that can make you feel very sick. Trazodone's active metabolite, mCPP, does the opposite of aiding sleep -- it's very, very activating, often in an unpleasant way." I extracted that one bit out of the link, I really can't state it better than how Altostrata did. p.s........and oh, I know Asta, you did good NOT getting involved in any W/D debates at the hospital. Hugs. It increased appetite, W / D? It is very tempting sweets. Very common sweet tooth with this. Hey, not bad. Sometimes I feel joint pain, anxiety less and shorter. I want to reduce trazodone. Two days, when I am reducing trazadone, I am taking 67 mg, it's very difficult to divide. Had a bad sleep this night, and in the morning my head was bad and a little sick. Hi, 10 weeks off escitalopram. 6 days, when decreased the trazadone (67 mg). In the morning, the headache, feel sick. Short ear and throat pain, short term air gap, a slight dizziness, slight anxiety.